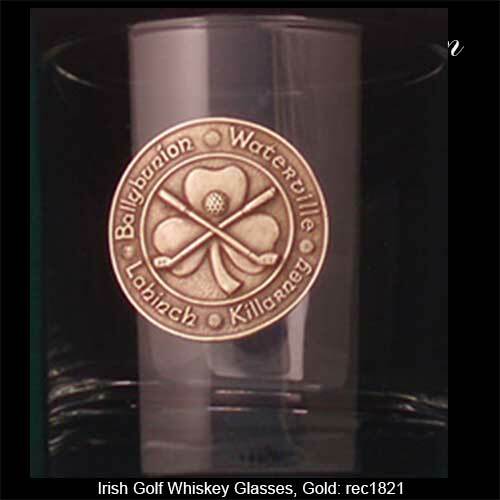 Whiskey glasses feature an Irish golf motif that is enhanced with crossed clubs over a shamrock. Lahinch, Killarney, Ballybunion and Waterville are the names of the famous Irish golf courses that are engraved on these Irish whiskey glasses. These Irish whiskey glasses feature gold plated over pewter emblems that are enhanced with crossed golf clubs superimposed over a shamrock. The emblems also feature the names of four famous golf courses in Ireland. The set of four Irish golf whiskey glasses are dishwasher safe and are made in the United States. The Irish golf lowball glasses hold 10 ounces of whiskey and are gift boxed with a shamrock history card, complements of The Irish Gift House. These Irish glasses are sold as a boxed set of four. Whiskey glasses feature an Irish golf motif that are enhanced with crossed clubs over a shamrock. 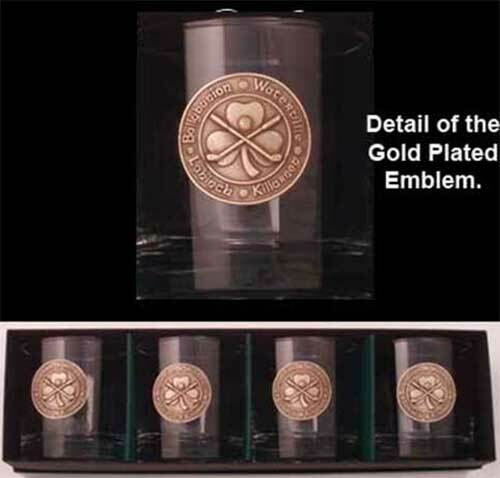 Irish whiskey glass set features pewter emblems that are enhanced with blessings and shamrocks. Irish whiskey glasses feature pewter emblems that feature the Claddagh and shamrock along with the harp and Ireland. Irish whiskey glasses feature copper emblems with the Claddagh and shamrock along with the harp and Ireland.